A Celebration Of Origins — And Excellence! Dan Wesson, great-grandson of the original Daniel B. Wesson, had a different idea. Not only was he part of the original Wesson family he also served many years as plant superintendent of Smith & Wesson. So we can say he had both heredity and environment working in his favor. With the anti-gun hysteria of the 1960s leading to the Gun Control Act of 1968, it was not out of the possibility we would soon see a restriction on the number of guns one could own. Dan Wesson’s idea addressed this possible problem. Dan left Smith & Wesson in the late 1960s to form his own company. His idea was to use one revolver frame that would accept different barrels and cylinders, allowing several cartridges to be fired from the same basic gun. He downsized his ideas somewhat though, possibly because of the liability involved if someone should match up the wrong barrel and cylinder. Instead he stayed with the switch barrel idea allowing several different barrel lengths to be used on the same revolver, without having to use a barrel vise to affect the change. His design consisted of a barrel threaded at both ends to allow it to be installed in the frame by hand. It was then set to the proper barrel/cylinder gap, fitted over with a barrel shroud, and locked into place with a nut at the end of the muzzle. This latter step was done with a special wrench supplied with each revolver. This arrangement resulted in exceptional accuracy. In addition to the barrel set up, Dan did away with the standard grip frame, replacing it with a stud. This allowed a one-piece grip to be fitted over the stud and locked in place from the bottom. This had the advantage of being able to tailor-size the grip to the individual shooter. That first Dan Wesson, the Model 12, with the barrel nut sticking out of the end of the barrel and shroud, was as homely as Aunt Minnie. This was soon addressed by placing the nut inside the shroud, adding greatly to the appearance. Along with the most usable grips ever offered on a double-action sixgun, Dan Wesson revolvers also had an exceptionally high-polished bright blue finish. The addition of a full under-lug barrel also added to the appearance. The .357 Magnum Model 15 was one of the most prevalent revolvers found on the Long Range Silhouette line in the early days. Dan Wesson would go on to produce both blue and stainless revolvers not only in .357 Magnum, but also in .22 Long Rifle, .32-20, and .32 Magnum on the medium frame revolver; .41 Magnum, .44 Magnum and .45 Colt in the large frame revolver; and also a stretch-frame version for the longer SuperMag cartridges, .357, .375, .414 and .445. There was even a small-framed L’il Dan .38 Special pocket revolver as well as the very rare Model 460 and Model 360. The latter used a cartridge length between the .357 Magnum and the .357 SuperMag. Unfortunately the Wesson family lost the company as it went through four owners and then fortunately was purchased by CZ-USA, saving it from disappearing altogether. With the acquisition by CZ the focus changed from revolvers to semi-automatics, with the result being some of the best factory produced 1911s offered today. Dan Wesson had ridden the crest of the wave of Long Range Silhouetting and when this wave subsided Dan Wesson lost most of their customers. CZ-USA knew 1911s could be made easier and quicker than revolvers, and they could also be sold for a greater profit, so by 2003 Dan Wesson had basically changed from a revolver manufacturer to a company producing fine 1911s. Here, Dan Wesson’s Model 715 is nestled with a Benchmade Griptillian folder and SureFire Stiletto light. The first new Dan Wesson 1911 models were given the name Patriot and offered in two versions, the adjustable sighted Expert and the Combat Carry Marksman. Both were offered in either a brushed stainless finish or chrome moly blue. My first Wesson Patriot was an Expert with a deep blue finish. Features of that first pistol were extensive. They included a Series ’70s-style forged frame, beavertail grip safety, Commander-style hammer, lowered/flared ejection port, external extractor, slanted cocking serrations on both the front and rear, matte finish on the top of the slide and dovetailed sights consisting of a front post and fully adjustable rear sight. It almost goes without saying this was an exceptionally accurate 1911 and has served me well for nearly 15 years now. To celebrate 50 years of Dan Wessons, CZ-USA is offering a special 50th Anniversary Limited Edition .45 ACP 1911. Even though this is a 50th Anniversary Commemorative it’s also a full working .45 ACP. No plastics here; all-steel construction for which I say a hearty thank you. The base gun is the standard Dan Wesson 1911 with a 5" barrel, fitted with excellent sights. The rear sight is a Tactical Night Sight matched up with a gold bead front sight. Often gold beads are mismatched to a rear sight with a square notch. What I particularly like about the Dan Wesson sighting arrangement is the fact the rear notch is a “U” mating perfectly with the round bead, easy to see and pick up quickly. Both sites are mounted in a dovetail with the rear sight locked in place by a screw. The barrel is match grade and the safeties are typical .45 ACP consisting of a serrated thumb safety and a mandatory, for me, high beavertail grip safety with a notch in the top to accept the cocked Commander-style hammer. The flat mainspring housing is checkered, and the magazine release operates positively dropping the magazine with a touch of the button. Two flush-fitting (thank you!) 7-round magazines are supplied. This tool secures the barrel nut on the muzzle. The embellishments for this 50th Anniversary .45 ACP consist of a deep blue finish much like found on the Dan Wesson revolvers in the 1980s, and scroll engraving on the polished Nitride slide. Scroll engraving is also found at the back of the slide behind the cocking serrations and other areas. The grips are special faux-ivory G10 with gold Dan Wesson emblems inlaid in both grip panels. There is also a gold DW at the bottom of the beavertail on the memory bump and a gold 50th on the recoil spring cap. 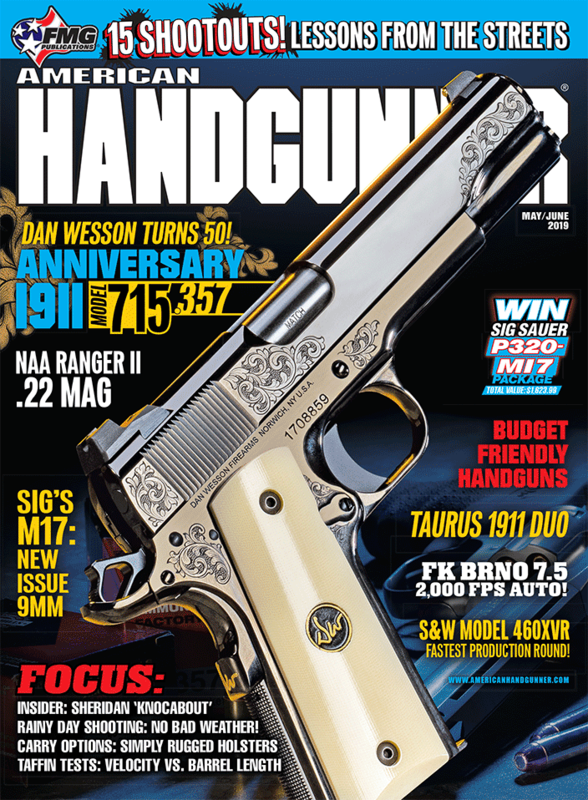 Dan Wesson describes this as “... a very special Dan Wesson 1911. Understated class was the theme of the bill, with tasteful engraving on slide and frame, a high-polish nitride finish to resemble a quality deep blue. G10 grips have the look of ivory.” Dan Wesson says this is “one of the classiest Dan Wessons made to date.” I can’t argue with that. This .45 is not just another pretty face but a full-working 1911. To this end the excellent sights are mated up with an excellent trigger with no creep and a pull just under four lbs. ; something rare with many production 1911s these days. Nothing has to be done to make this .45 ready to shoot. I like it so well I ran it with two dozen different factory loads, traveling the full gamut from 135-gr. Black Hills Honey Badgers up to and including 230-gr. FMJs and JHPs from several manufacturers. It performed flawlessly with everything I tried. This really is a first-class gun. Sights were basically dead on for elevation and only required to be moved slightly to the right for windage. The most accurate loads proved to be the Black Hills 185-gr. Barnes TAC-XP +P and the Black Hills 185-gr. JHP, both grouping five shots in 3/4" at 20 yards. The HPR 185-gr. JHP with a 7/8" group and the Buffalo Bore 185-gr. FMJ-FN with a 1" group added to the magic. The new American Eagle Syntech 230-gr. Range Ammo also grouped in 1" for five shots and the SIG SAUER 200-gr. JHP was just over 1". Consistent accuracy across the board. Dan Wesson/CZ-USA has not abandoned its roots. In addition to their 1911 models they are also offering the Model 715 stainless steel .357 Magnum revolver. It has the trademark heavy underlug barrel with fully adjustable sights and a full-length barrel rib. It’s also fitted with rubber finger groove grips. This new gun is just as accurate, maybe more so, than the original Model 15. I fired 30 different loads through this new Dan Wesson. With 12 different factory loads ranging in weight from 125 to 180 grains the average group for five shots at 20 yards was under 1"! My .357 Magnum handloads averaged right at 1" too. I was especially pleased with my loads assembled with the Lyman/Thompson #358156GC, giving groups of well under an inch too. Dan Wesson still knows how to build revolvers! These were top quality guns and a genuine pleasure to test!